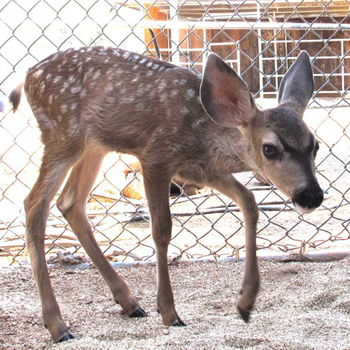 When Lou arrived at the sanctuary in the summer of 2012 he was a tiny, spotted fawn. It had been many years since Southwest Wildlife had taken in a deer fawn and we were totally smitten. We were told he was a doe and a donor named him Luana. Later, a more thorough check revealed that he was definitely a buck! With those facts in hand, he became just Lou. His first set of antlers were just awful looking. It seems that he was trying out his manliness and somehow broke one of them, leaving it hanging down and looking quite odd. By his third birthday and his second set of antlers they were looking better, and Lou was developing a thick neck and powerful body to carry them. He began to look for anything and anyone to spar with and we could no longer safely enter the enclosure during the breeding season. It’s necessary to separate him from the ladies during that time. He was a darling fawn! It’s hard to believe he was ever that tiny fawn or awkward teenager. What a handsome buck he’s become! 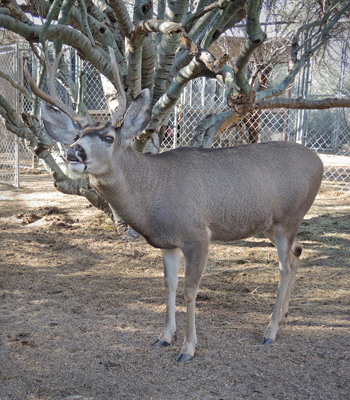 We had not planned to have a mule deer buck at the sanctuary, as they can become difficult to manage, but Lou’s family now and he’s here for life. Your sponsorship of Lou helps all of our deer. 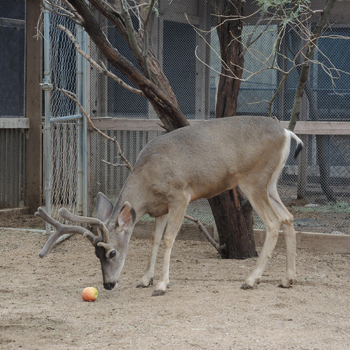 Since he takes up half the deer enclosure for part of every year, we are in the process of enlarging the deer area to accommodate him, thanks to your donations!